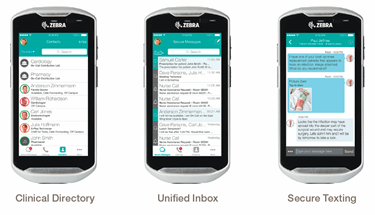 The tough hospital environment meets its match in the light, rugged, pocket-sized Zebra TC51-HC with Vocera running on it. Customers looking for a turnkey solution that allows clinicians to reach the right person at the right time, on the right device, with the right information, and in the right place, now have the answer with the new Zebra TC51-HC smartphone. Vocera Collaboration Suite is now available on the TC51-HC to improve extended care team communication and collaboration by providing secure text messaging, access to critical clinical data, alerts, and alarms. Enhance patient safety, the patient experience and healthcare staff productivity with the pocket-sized TC51-HC which includes a large high-resolution 5 inch display, blazing fast processor, and front facing camera.